Posted on May 31, 2018 at 4:16 pm. In a city known for murals, how do you get your foot (or art) through a door when you’re an emerging artist of color? Fresh Paint, a partnership between RACC’s Public Art Murals program and Open Signal, offers that door to have artist work in the public realm. In our 2017 pilot year, Fresh Paint gave three emerging the opportunity to paint a temporary mural on the exterior of the Open Signal building facing the highly-visible Martin Luther King Jr Blvd. Each mural is then up for a period of months until it is painted over in preparation for the next mural. But what’s unique about this program is that it doesn’t just provide a wall for a mural – the program offers resources emerging artists would not typically have access to, which then gives them space to explore working in the public sector and incorporating new approaches and skills in their artistic practice and experience. Alex Chiu, one of the three artists who participated in the pilot year, is a Chinese-American painter, illustrator, and arts educator living in Portland, Oregon who has been practicing art professionally for over 10 years. Over the past few years, Alex has been an illustrator for children’s books for Little Bee Books, a muralist for Trimet and APANO, an animation instructor at Open Signal, and a stay at home dad to his 3 year old daughter. Tell us about the mural you created for this program. Can you walk us through your process of conceptualizing a mural and bringing it to life? As a stay at home father, most of my personal inspiration comes from spending time with my daughter. The mural that I created for this program is based on a home video that I captured of my daughter jumping up and down on a bed. Using computer software, I was able to isolate 6 separate frames from this video. I took those frames and used them for my mural image. The mural itself consists of 6 images of my daughter in different stages of jumping. They are depicted from left to right and are meant to evoke the concepts of movement, animation, and film. What was it like to paint your first mural on the Open Signal building? The opportunity of painting a mural for Open Signal was exciting. I also felt honored to be one of the first artists participating in the program. The design that I chose to paint was a bit of a departure from my usual style of painting. I normally paint and draw in a very bubbly and cartoon-y style. For this image, I was working with photo reference and painting in a more proportionally realistic style. This shift in style pushed me as an artist. Also, working at such a large scale was a bit of a challenge. I found that the hardest part of the process was painting on a slatted wooden surface; the gaps between each wooden beam were difficult to paint. Overall, I learned a lot about painting on a larger scale and working outdoors. It was a great learning experience for me. 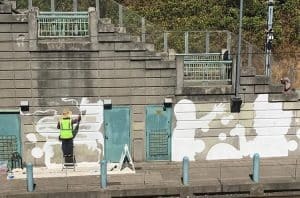 Since your Fresh Paint mural, your work has been popping up in other parts of Portland. What are some lessons you’ve learned along the way since your first mural? Since the Fresh Paint mural, I have finished a large mural project at the NE 82nd Ave. MAX Station, collaborated on a mural with ALLY (Asian Leaders for the Liberation of Youth) at Mojo Crepes, and also painted an outdoor mural at Prescott Elementary School. 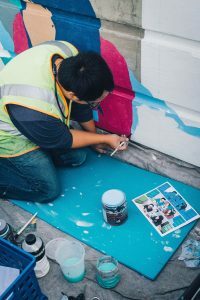 I have learned several lessons from the Fresh Paint project including what tools to use for murals, how to paint while outdoors, how much time it takes to paint a mural, and how to keep proportions while painting at such a large scale. The experience was valuable to me and gave me exposure and credibility as a muralist in the city. As an emerging muralist, what thoughts or words do you want to offer emerging muralists/artists? I believe that success in art comes from getting work done regularly and keeping up with the momentum. After working on several mural projects in Portland already, I have been doing my best to push myself to continue and build my skills and portfolio as a muralist. I definitely see myself as a beginner when it comes to mural work. I also feel like this process has pushed me to become a better painter and ultimately has improved my style and technique of painting. This project has definitely opened doors for me and I am working hard to keep moving forward with these new opportunities. What are you up to now? Where can we find you and your work? I am currently painting a second mural at Mojo Crepes on SE Division St. I have also signed a contract to begin brainstorming ideas for a mural at Robert Gray Middle School. I will also be the father of two in about a month. My wife is pregnant right now and due in late June. Most of my newest work can be seen on Facebook and Instagram. I also have a website that needs to be updated at alexdoodles.com. Catch our short interview with Molly Mendoza, Fresh Paint’s inaugural muralist, here. Calls for artists to participate in Fresh Paint program’s second year cohort are now available. Deadline to apply is July 16. Join us for an artist information session June 19 to get your questions answered. Fresh Paint is a partnership between Regional Arts & Culture Council’s Public Art Murals program and Open Signal, a community-driven media arts center. To learn more about the program, contact Salvador Mayoral IV (RACC) or Daniela Serna (Open Signal).